There are lots of websites, blogs and guidebooks that offer advice on what to pack for a day hike, including some excellent guidance for beginning hikers. 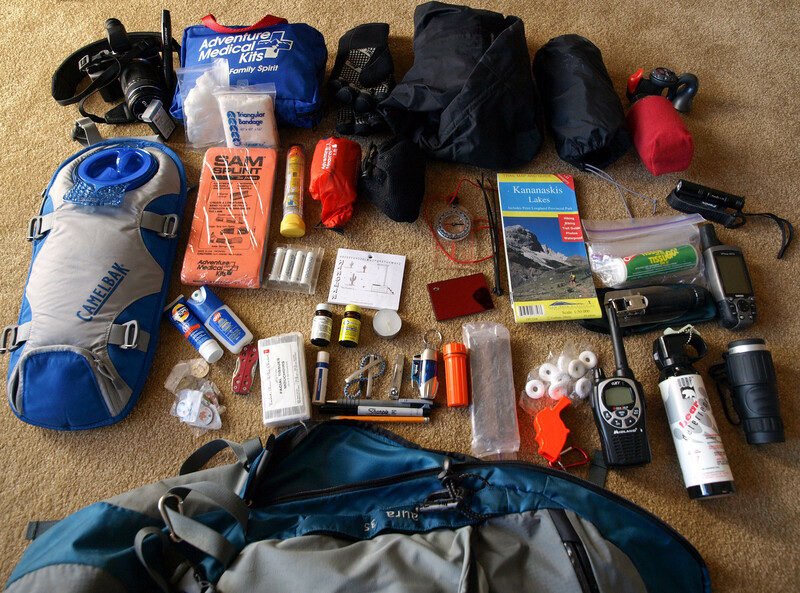 This post provides a quick overview of what we typically bring along on a day hike in the summer. Keep in mind we’re a family of four: Mom, Dad and two sons (ages 15 and 11). While our oldest son now carries most of his own gear, we tend to limit our youngest son’s load to his water for the day, a couple of snacks and maybe a point-and-shoot camera. Rather than laying out everyone’s pack and contents, this post will focus on what Mrs. GeoK typically carries on a summer day hike. NOTE: when hiking in the shoulder season we add a fair bit to our loads, including a toque, an extra pair socks, a set of thermal underwear and an extra sweater for each of us. Mrs. GeoK packs just about everything but the kitchen sink for a day hike. Her pack usually weighs in at about 10 kg (22 lbs), which lightens up she drinks water. So, what is all this stuff? Starting from the top left, her camera gear (watch for a separate post in the coming week, outline the camera gear we bring along on a hike). Then there’s a grouping of first aid stuff: a family-sized basic first aid kit (checked each spring so that anything with an expiry date can be refreshed), extra gloves, triangle bandages and a SAM splint. Both Mrs. GeoK and oldest son completed a two-day, basic first-aid training course within the last eighteen months. A little further to the right is an Epi-pen; we usually carry a few of these, along with Benadryl, on account of some severe allergies within our family unit. Moving further right, still across the top of the photo, is our foul weather gear for the summer: neoprene gloves (to keep hands reasonably warm in the event of a torrential downpour or a mid-summer blizzard), good quality rain jacket (with hood) and rain pants. If you look carefully, you’ll also spot the waterproof sac that can be used to cover Mrs. GeoKs’ day pack, along with a bivy sack, to be used as an emergency sleeping bag, warming blanket or very basic shelter. And ‘though not in the photo, we each carry a small camping towel, which can be handy in an emergency. On the far right, still at the top of the photo, is an air horn. We carry air horns, along with bear spray, in the event of an up-close encounter with a bear, cougar or wolf. Some references suggest using an air horn may scare the animal away. It’s very light, as there are just a few plastic part filled with moderately compressed air, and if nothing else, it would serve as a loud emergency signal. Back to the left side of the photo, a little lower down, is an insulated 3 litre Camelbak. Depending on the distance we’ll be hiking, we carry anywhere from 1.5 to 3 litres of water per person and leave additional water in the vehicle, in case we’re all out of water by the time we return to the parking area. Also, you’ll see two small glass bottles in the photo: these are a very basic water purification system, just in case we end up stranded in the mountains overnight. Moving right from the top of the Camelbak, sunscreen and mosquito repellant are basic essentials. Elsewhere in the photo you’ll spot a tube of lip balm and a set of nail clippers, a couple of personal items that Mrs. GeoK likes to tuck into one of the waist pouches on her pack. Other odds and ends in the middle of the photo include a small notepad, which can be used for playing hangman, tic-tac-toe, emergency replacement logs in caches, etc. There’s also a couple of pens and pencils. Right around the center of the photo are a few other safety-based items, including a compass, a detailed topo map of the area we’ll be hiking, a copy of the trail description and a signal mirror. A little below the safety mirror, you’ll spot a bright orange safety whistle and a little to the right of that, a canister of bear spray. NOTE: For a few of the trail in Banff National Park, Parks Canada is requiring that hikers travel in groups of at least four and that at least one person in the group carries bear spray. It’s a good idea to check trail conditions – including any such restrictions – before heading out to hike. There are a few more things Mrs. GeoK carries that she hopes never to have to use on the trail: a small shovel, TP and ziploc baggies – just in case; some small candles, fire starter, a lighter and a container of waterproof matches; a multi-tool; and a flashlight. A few other items that are tucked into the other pack waist pouch include a handful of pathtags (to leave in geocaches), some tissues, a handful of lifesavers, and a hair fastener and clips (just in case it gets really windy). Finally, a few electronics and gadgets: a Family Service Radio (FSR, aka walkie-talkie) (every member of the family carries one of these, so we can keep in touch if we get spread out along the hiking trail or in case one of us goes off to do a bit of exploring while the rest of us relax after lunch; also, we might be able to reach help in case of an emergency); a GPS receiver (loaded with geocaches in the area); and a monocular (all the better to see wild animals, distant hikers, soaring birds or anything else that catches our eye). All of that goes into Mrs. GeoKs’ well-fitted Osprey Aura 35 litre pack, along with a hearty packed lunch. Her pack usually weighs in around 10 kg (22 pounds) at the start of the day, and her load becomes lighter as she drinks her water supply for the day. The packing list has evolved over the years, based on our hiking experiences. For example, we never used to carry neoprene gloves and we’d only take full rain gear if the weather forecast included a chance of rain. But after getting caught in an early August blizzard a few summers ago, we now carry full rain gear regardless of the forecast, neoprene gloves for everyone and emergency fire starting supplies. This overview of Mrs. GeoKs’ day hiking pack contents applies for pretty much any wilderness hike longer than about 10 km. Anything shorter than that, we usually lighten the load, unless we’re out with people who aren’t very experience hikers and feel it’s prudent to bring along the full range of emergency supplies. And this overview excludes any consideration of hat, sunglasses, hiking footwear, trekking poles, and other important articles for an enjoyable hike. What about you? What do you take on a day hike? And if you noticed anything that you think we’ve overlooked, please leave a comment with your advice. How do you like your Osprey? I just got a Sirrus 36 because of my husband’s good experience w/ his Osprey. I’ve only had mine out once so far. Thanks for the great post. Love my Osprey…have hiked with it for 3 or 4 seasons now and it’s perfectly adjusted to take all the weight in my hips, so I don’t get as many of the post-exercise headaches that I used to after hiking. The waist pouches are convenient and the Camelbak pouch is essential. The only downside is that we had to purchase separate waterproof covers. My smaller Camelbak pack has a built in rain cover.